Do you love follow New York Fashion Week? Nothing sparks imagination in all realms of art and design like the streets and sounds of New York City during Fashion Week. Setting the trends for the upcoming seasons, these designers put their most imaginative and innovative styles on the runway to reveal to all. We are a huge fan of the creative invitations and event showcases that these designers also plan. See our favorite looks, invitations, and after parties on our New York Fashion Week Pinboard. If you are a trendsetter that enjoys browsing through hundreds of photos of New York Fashion Week, then you are like most people that enjoy preparing their fall wardrobe for the coming season. With summer coming to a close, it's time to welcome back chunky sweaters, boots, and layers! Just as you refresh your fall clothing wardrobe, now is the perfect time to change up your personalized stationery and correspondence. 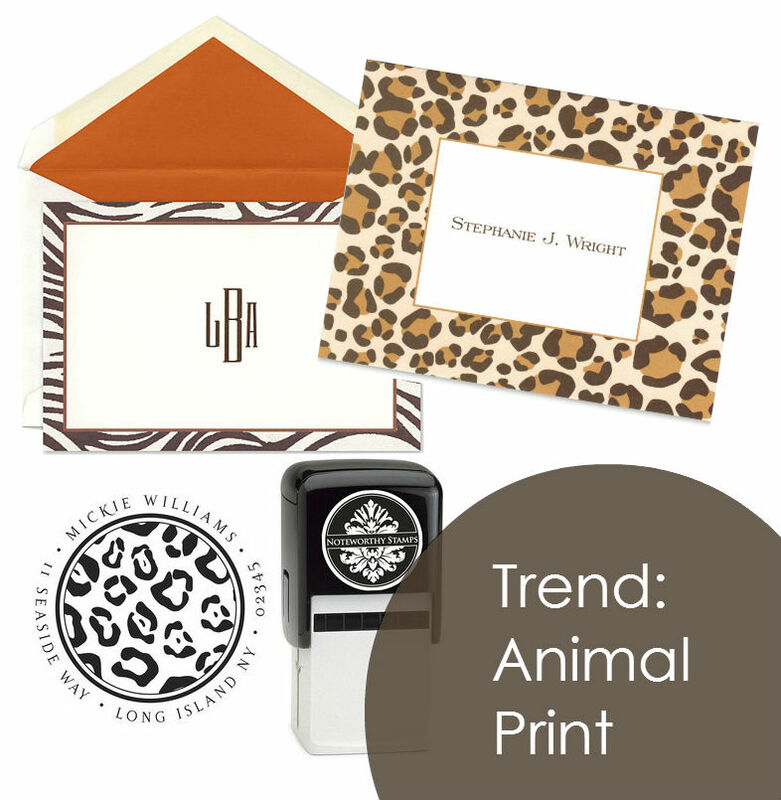 We've gathered the 4 must have fashion trends for fall 2013 and their stationery counterparts. A good leather statement piece never goes out of style, and the same goes for custom stationery and gifts. Leather is a huge trend this fall, especially in the classic black. From motorcycle jackets, to leather pants, and leather accessories, you can never go wrong with black. For stationery picks, we suggest picking the classic black option as well. Black is a color choice that will never go out of style. This Allie Monroe Faux Skin Black Boxed Set is a great pick to add signature style to your office space. The luxurious flat cards are accented with a textured crocodile leather like envelope that will amaze any recipient. The set comes complete in a matching black box that is nice to display in any room. Continue the chic black trend with a personalized iPad case for your traveling device. Monogram a fine leather iPad case with your initials to make the item extra special. 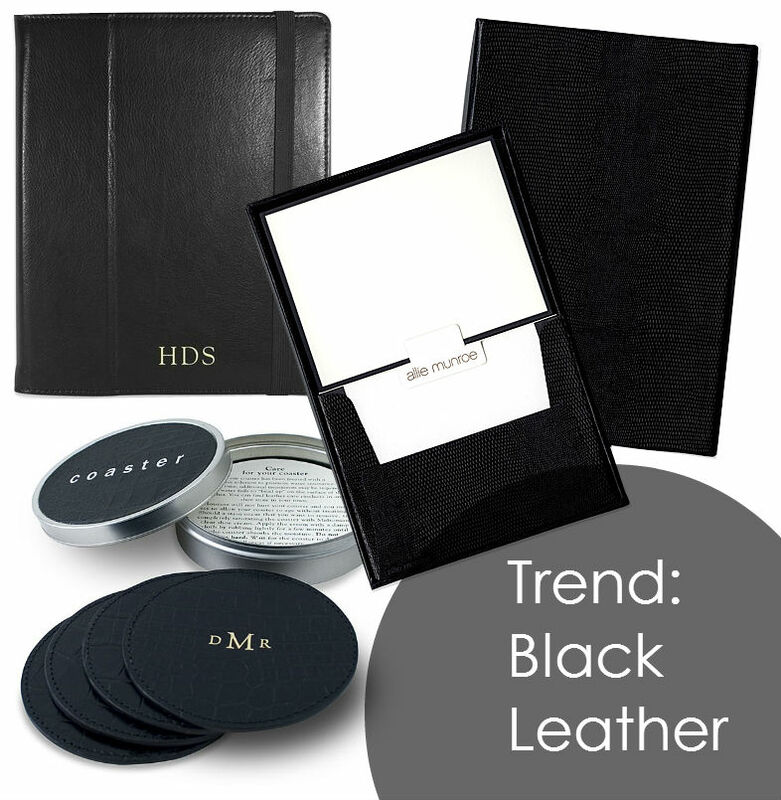 (Graphic Image Black iPad Case) Finally, take the personalization to the next level with custom leather coasters for your home. Whether used in the office, the bar, or given as a gift, these classic leather coasters are durable and chic for fall entertaining. Personalize these Graphic Image Black Crocodile Coasters with a monogram of your choice. 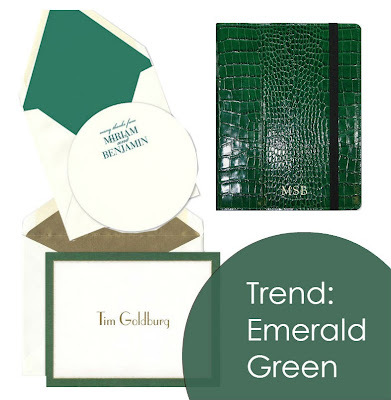 Named Pantone Color of the Year 2013, emerald green is the color to stock up on this fall. This gemstone hue is a great color to match with almost anything, and gives just enough vibrant color to splash into your stationery wardrobe, without being too bright for the season palette. Popular in wedding color palettes this year, emerald anything makes a great gift for yourself or friends. This unique circle flat card from Vera Wang (Vera Wang Radiant Circle Flat Card) is a great modern piece to send good cheer to friends. The personalized tablet case is a lovely addition to your tech gear, Graphic Image Green Croc iPad Case. Finally, don't forget to play it safe with a classic note card with a simple design to have for any occasion that requires a note (Caspari Moire Green Note Card). Metallic is a must-have for this season to add a little sparkle to your statement. When it comes to stationery, nothing is more important than portraying a statement with your paper presentation. Our top picks for metallic stationery is this brilliant Caspari Golden Rule Flat Card that combines great gold borders and a classic monogram for an on trend yet classic style. For a more luxurious touch, this silver shimmery note card has a great sparkle when received (Checkerboard Silver Shimmer Note Card). 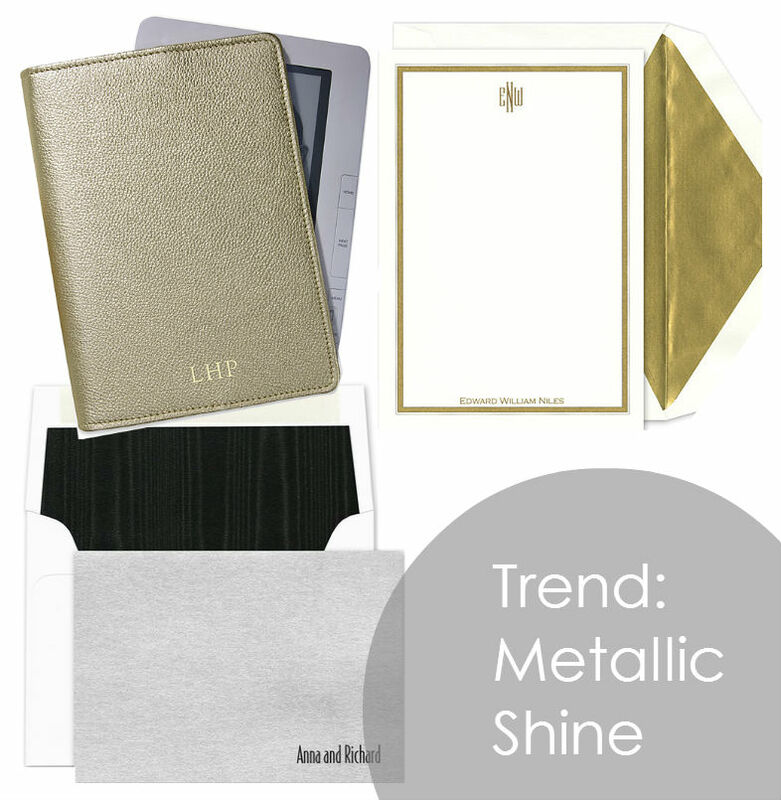 Finally, top off your office look with a great personalized eBook reader case with your personal initials, Graphic Image Gold eBook Reader Case.